A few months back Pastor Tim preached to us about praying BIG AUDACIOUS PRAYERS, since then when faced with decisions or a chance to do something or go somewhere – we take a deep breath and we remind each other – BIG AUDACIOUS PRAYERS. Over the past few months we have been faced with some decision making, some dreaming and some big ideas to bring change into the lives of our little family, in the midst of this before the outcome was revealed or before things have had a chance to be finalized I was reminded of something else – I was in my backyard, my little piece of heaven on earth and I was reminded to BLOOM. I was reminded to bloom right here, right now, to bloom right where I was planted in this very moment at this very time. This has been a continuous way of life for my husband and I, over the past few years, when faced with an opportunity for a promotion. 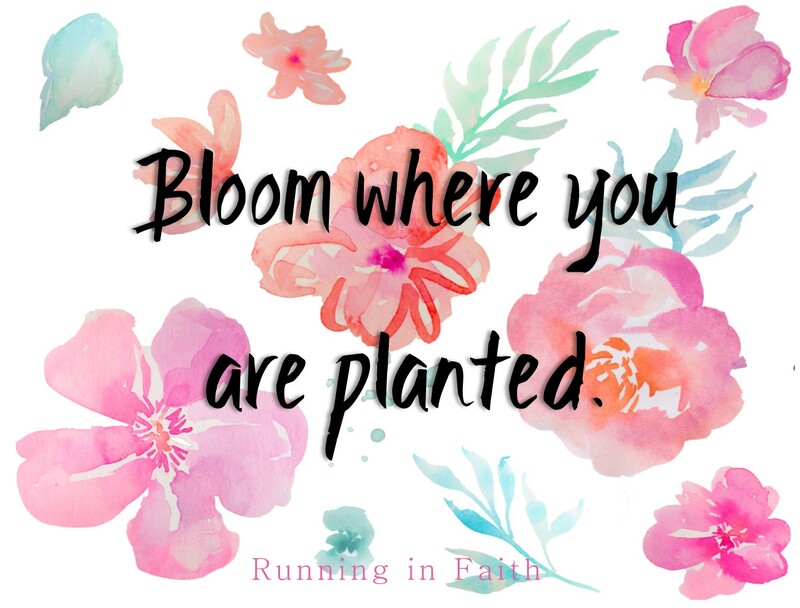 During the turmoil of who and when, we had to pause and be reminded to bloom right where we were planted. In other words to be grateful for our blessings – I remember talking to my husband and saying “you do your (current) job fully and honorably, don’t worry about anything else”. In my own job I’ve wondered sometimes “why”, why here and why now, over and over again I’ve realized I am where I need to be in this moment and time. In all of our plans and dreams recently I’ve lost track again of where I am currently planted – or have I? Thankfully, I haven’t, my mind wonders and runs wild sometimes but my heart is right here. I was working in my little piece of heaven on earth the other night, checking on my plants, watering the yard, treating for bugs and cleaning up. I got carried away and before I knew what time it was, my husband was taking little bear a bath and I was outside in the silence of the evening, the sun just finished setting and I turned on the lights to our patio I sat there and just listened. Where are we going, when are we going, how are we going… to take the next step. Pray big audacious prayers, but take care of what’s around you right now, right here – take care of the blessings daily don’t take them for granted. How can you ask for more, dream for more when you are not being a good steward of what’s laid out before you now. Not only should I bloom in the right here and now, but live life in full bloom. Make the most of where you are take care of it as if were the bigger and the better because truly it is bigger and better than where I’ve been before. My current chalk art for my home, as a reminder to live life in full bloom. A special thanks to Angie Makes for beautiful watercolor flowers!